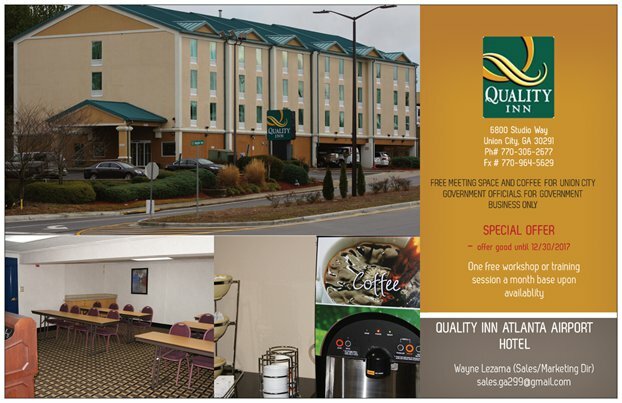 The Quality Inn® hotel in Union City near the Fayette Pavilion Shopping Center lets you relax and focus on the people and experiences you came for. Conveniently located off Interstate 85, this pet-friendly Union City hotel gives you easy access to other local sites, activities and attractions, including Atlanta. Our Value Qs deliver professional, responsive and friendly service, as well as amenities that give you more for your money such as: Free hot, fresh and healthy breakfast Free WiFi Exercise room Free coffee Copy, print and fax machines Get your money’s worth at the Quality Inn. Union City hotels like ours offer the best hotel rates and the best amenities, so you can focus on the people and travel memories that really matter. Book today!